Many of the health benefits of peaches are based on the fact that they are high in vitamin A, vitamin C, vitamin B, vitamin E, folic acid, potassium, and numerous other nutrients. During pregnancy, vitamin C is necessary to help the baby form his bones, teeth, and connective tissue in the skin, cartilage, muscles, and blood vessels. It has also been linked to its ability to prevent preterm labor and perhaps even reducing stretch marks (although I think that might be because women who eat healthier tend to take care of their bodies and naturally prevent stretch marks). Vitamin C also helps the body to be able to absorb iron, another important mineral during pregnancy. Add to that the fact that peaches are actually rich in usable iron, and you're getting quite a bargain in one piece of fruit. Folic acid is one of the most important nutrients when you're in your first trimester, and even before you know you're pregnant. Most women who are planning to conceive are aware that they should supplement their diet with foods rich in folic acid, in addition to taking a prenatal vitamin. Women who lack folic acid in their diet early in pregnancy are more likely to have babies with neural tube disorders like spina bifida because the spine and brain start to develop very early. Peaches are also high in potassium, which is helpful for preventing fatigue, muscle cramping, and anxiety, all of which can be common during pregnancy. 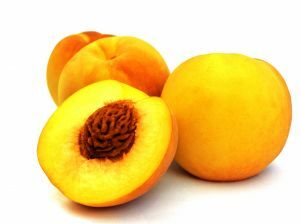 Like most other fruits and vegetables, peaches are high in fiber. Fiber is especially important during pregnancy because it helps to clear the body of waste, aid in digestion, and clean the intestines. If you drink plenty of water and eat plenty of foods rich in fiber, you can avoid constipation and other gastrointestinal distresses that plague many pregnant women. Also like many fruits, peaches are great for cleansing your liver and bladder, and keeping your heart functioning properly. And, finally, when it's time to start losing baby weight, peaches are very helpful. Peaches low in calories and aid in general digestion, which keeps your body weight regulated, and additionally, the skin of peaches has a compound that helps to break down fats. As a fun last tip about the health benefits of peaches- I've read that rubbing a fresh, ripe peach on your skin can help retain moisture and tone your skin. How about that for a fresh facial?